Two pieces of art by Cape Cod artists, “Cormorants on Grassy Island, Woods Hole,” a woodcut by Jane Fay Baker of Falmouth and “Triptych Panel #3,” oil on canvas by James Broussard of Provincetown, were selected by James Stanley, the Visual Arts Coordinator for the Fine Arts Work Center, from an open call. Then we posted the images and asked Cape Cod poets to respond with words. “Poseurs” by Judith Askew and “Cusp” by Melanie Braverman were selected as the two winning written responses. Their collaborations are joined by collaborations drawn from the Cultural Center of Cape Cod’s annual Mutual Muses project and Broadsided Press. On Friday, May 16, 2014 a reception and kickoff event was be held at the Transportation Center in Hyannis. The broadsides rode the buss all summer, traveling the entirety of Cape Cod with locals and visitors alike. David M. Cravenho is an artist currently working on Cape Cod whose work appears in permanent collections around the world. He has taught at the University of Georgia in Cortona, Italy and at Massachusetts College of Art where he received a Masters of Science in Art Education. He received a Masters of Fine Arts from Rochester Institute of Technology’s School of American Craftsmen. He has had Artist-in-Residencies at the Archie Bray Foundation, Banff Centre School of Fine Arts, and Watershed Center for Ceramic Arts, among many others. Poet Barry Hellman is a clinical psychologist who organizes and hosts poetry and music events, publishes the Cape Cod Poetry Group on Facebook, and leads poetry workshops. His poems have appeared in literary journals, anthologies, broadsides, and a chapbook, The King Of Newark from Finishing Line Press. 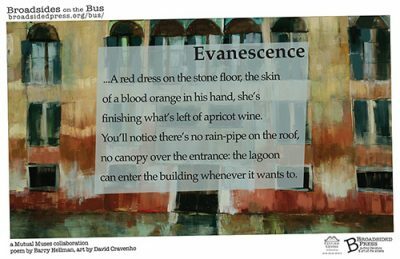 “Evanescence” is forthcoming in the Cape Cod Poetry Review, Winter/Spring, 2014.